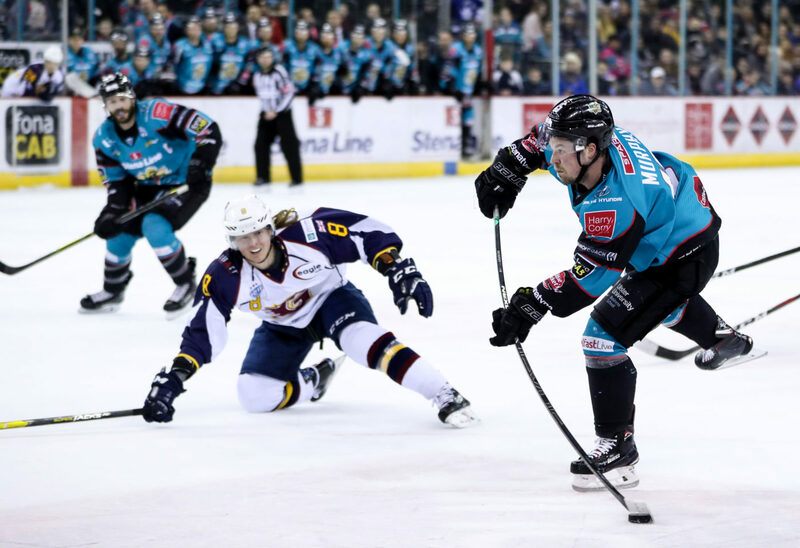 Despite the encouraging sight of Patrick Dwyer dressed for warmups, the Belfast Giants, were unchanged going into Saturday’s sequel against the Guildford Flames. 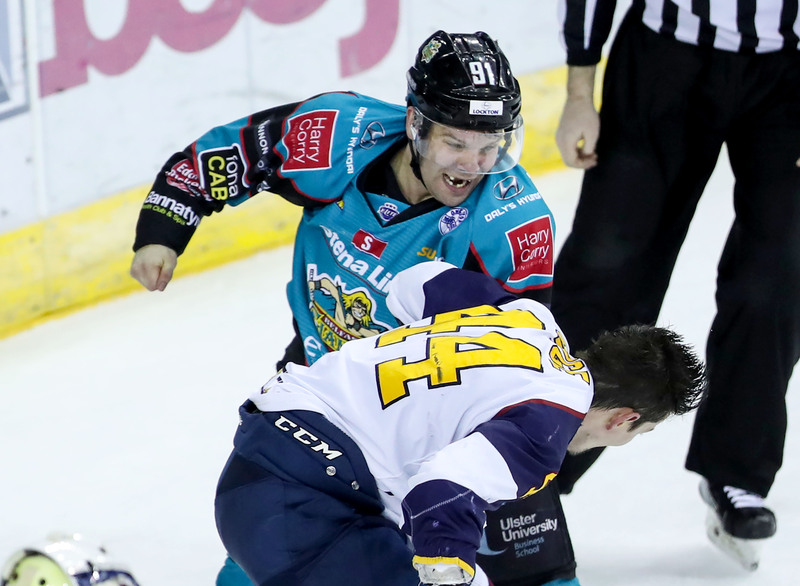 The visitors meanwhile opted for Travis Fullerton in goal over Chris Carozzi, and took to the ice in Belfast hoping to frustrate the home fans once more. An early Giants power play opportunity came in the shape of a Kruise Reddick slashing call within the first minute, but the home side’s special teams stuttered on their first outing of the night. The Guildford bench made their displeasure known, and were granted some reprieve through a Curtis Leonard roughing penalty at 5.34. The Giants PK unit were a match however. A much more feisty first than last night’s offering continued to unfold, with Guildford’s short bench digging hard and doing a solid job of smothering the Giants offense at the blue line. When the Giants found space however, they looked lethal. Eric Lindhagen headed to the box for slashing at 12.45 and the Giants poured forward- feeding pucks into the slot and screening Fullerton. However, it was cancelled out when Josh Roach headed to the home penalty box for unsportsmanlike conduct following a controversial offside call. 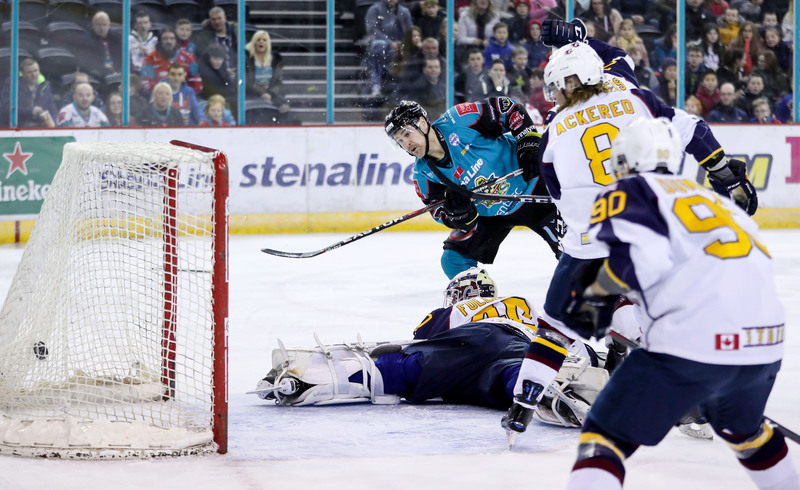 The Giants ended a frantic first period on the kill, as Dustin Johner sat for tripping at 18.40. Despite a couple of electric efforts by potent Flames threat Calle Ackered, the period ended at 2-0 to the home side. The Guildford power play which straddled the periods became a 5 on 3 for 7 seconds as Blair Riley joined Johner in the box for unsportsmanlike conduct at 20.33. Tyler Beskorowany stood strong at the back and the Giants saw out the danger. Jonathan Ferland took a holding penalty at 35.06 which was taken care of, and he almost added a 5th upon his release with 2 left in the period- Fullerton sprawling across the face of goal to deny him. With 41 seconds left in the period David Rutherford took exception to Jessie Craige in the east end, dropping the gloves and landing some big bombs for the clear win. He had an extra two minutes added to the pair of fives for a crosscheck. Blair Riley also found himself heading to the box for a crosscheck with 3 seconds left in the period- Guildford shrewdly pulling Fullerton to ice 6 men versus three as the period came to a close. Dustin Johner sat for interference at 47.06. 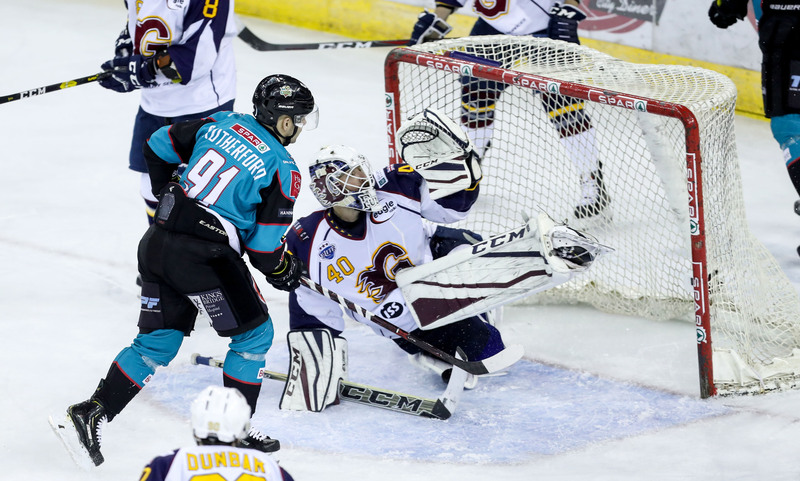 A great chance from the slot was denied by Tyler Beskorowany’s right leg, and the Giants tendy continued to be the difference maker as Guildford piled pressure forward. 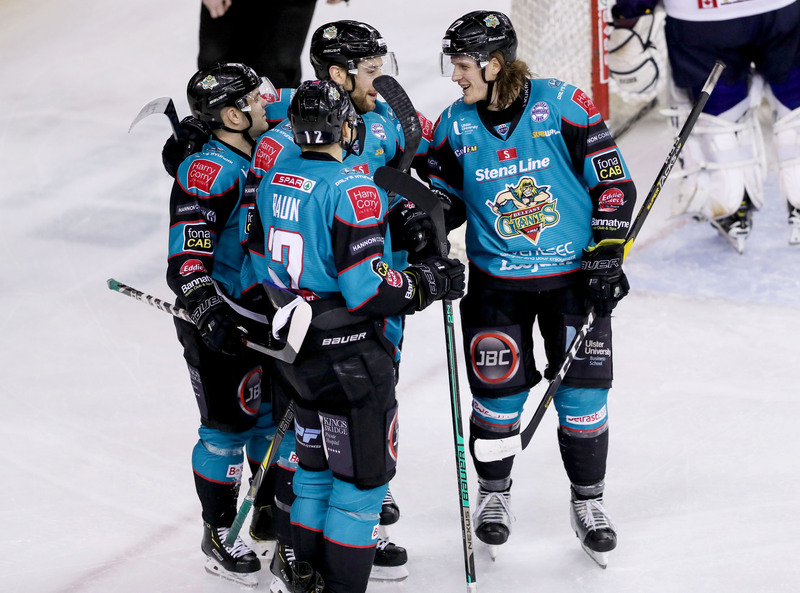 With the Giants in danger of letting this one slip away, a Jessie Craige hooking call provided a timely power play- and a chance to settle back into the game. There was just enough time for another fight- as Jonathan Boxill dropped with Brett Ferguson following a stiff hit on Lewis Hook. He was rewarded with a 2+10 for instigation in addition to his five for fighting. 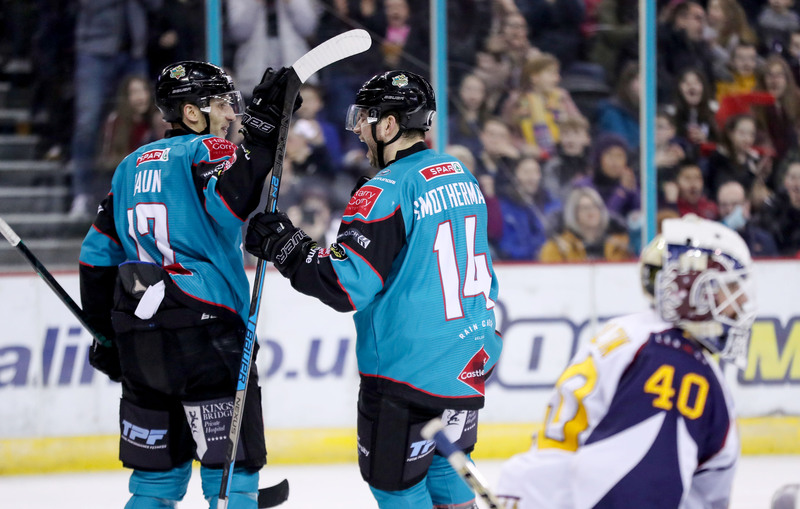 As time ran out, the SSE Arena rose to its feet for another precious two points in the race for EIHL silverware.